It’s two in the morning. The office is forty stories up, high above the sirens, the gunshots, the cries of pain and anguish that are the city at night. Michael is bathed in the glow of his laptop, typing furiously as he navigates the labyrinthine directories of the corporate mainframe. In the pale light of the doorway, Laenna’s silhouette stirs. “Someone’s on the elevator,” comes her whisper over the radio headset. “Come see for yourself,” Laenna replies. Sure enough, through the green glow of starlight googles the tiny numbers blink brightly as the elevator ascends. 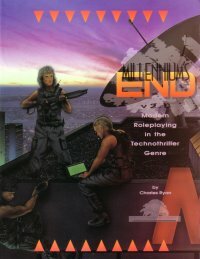 Millennium’s End is a critically-acclaimed roleplaying system set in a dark future just a few short years away. Based on today’s hottest technothriller movies and fiction, Millennium’s End has a gritty, realistic feel and a fast-paced, progressive game system. Characters carry out investigations, espionage, and para-military operations in a post-modern world where might makes right and all the cable news nightmares of today are a reality.